Lean Project Leadership is Published! Click on the book image to go to the order page. 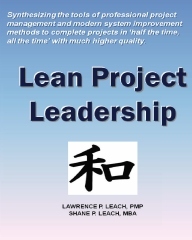 Lean Project Leadership extends the information of Larry's earlier books to show how to lead implementing Lean Project Management (LPM) in organizations. Honed by years of experience with organizations large and small and supplemented by the work of others in the fields of organizational change management, Lean, Six Sigma, and project management, Lean Project Leadership will help you transform project success. The FULL COLOR figures greatly enhance the utility of this book. Presented in an innovative format of two page modules with one or more graphics on the left side and focused text on the right side, This approach follows the suggestions of John Medina's Brain Rules, among other sources. Full color graphics on the left of each two-page module increase your learning with a visual that connects to the right side of your brain. Ten minute or less text on the right page of the module connects with the left half of your brain. They reinfoce each other. Lean Project Leadership provides a how-to manual you can easily refer to again and again, and share the information with others. Click here to look inside. Keep in mind that you should be looking at the two page modules in front of you. Major additions compared to other books in this field include detailed role descriptions for use in defining and measureing job performance, and specific informaiton for implementing in an organization. The role material uses the latest psychological methods from Performance Management and other sources. Implementation follows a proven method developed by John Kotter and others which we have tested and built on. This is a real how-to book, including details on how to build effective project schedule networks, communicate on projects, and everything else you need to lead project management performance in your organization to new performance levels.